There are less than two days left of bidding on one of the three original Obama Hope collages created by Shepard Fairey. The bidding is up to $108,000 at Lot #: 79609 in the Art for Life Auction run by the Rush Philanthropic Arts Foundation. Proceeds from the sale will go not to the Obama effort (though other auctions currently being held by Shepard Fairey are for the campaign), but instead to furthering arts access for street youth. To quote their website, "Founded in 1995 by brothers Russell, Danny and Joseph 'Rev. Run' Simmons, Rush Philanthropic Arts Foundation is dedicated to providing disadvantaged urban youth with significant exposure and access to the arts, as well as providing exhibition opportunities to under-represented artists and artists of color." "Born in Charleston, South Carolina in 1970, Shepard Fairey is a contemporary artist, graphic designer and illustrator. Fairey graduated from Rhode Island School of Design in 1992 with a B.A. in illustration. He is most recognized as emerging from the skateboarding scene and became most notably known for his 'André the Giant Has a Posse' sticker campaign and 'OBEY' street art movement. Since 1989, Shepard has consistently produced a wide range of artwork from screenprints, mix media stencil collage, to 15 foot mural installations. In 2007, Shepard embarked on a pivotal year with producing 3 major solo exhibitions in New York City, London, and Los Angeles. All 3 exhibitions sold out with a showing of over a 100 pieces of art in each exhibition. "Recently, Fairey has created a series of posters supporting Barack Obama's candidacy for President in 2008 which led a massive grassroots street awareness campaign. 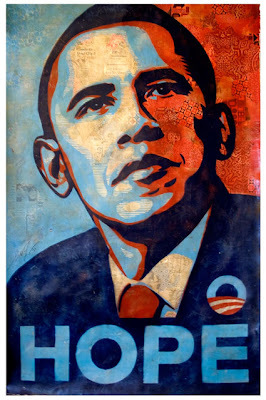 Fairey's 'PROGRESS', 'HOPE', and 'CHANGE' posters have created a huge impact in the visibility of the Obama Campaign, in which Senator Obama, himself, personally thanked Fairey for making this art. Since then he created an exclusive design for Rock the Vote, and sits on the advisory board of Reaching to Embrace the Arts, a not-for-profit organization that provides art supplies to disadvantaged schools and students. Shepard Fairey currently resides in Los Angeles, California."